The Ukrainian side of the Joint Center for Control and Coordination on ceasefire and stabilization of the demarcation line between the parties to the conflict in Donbas states that the illegal armed Forces of the ORDO continue firing on the peaceful settlements along the line of delineation using the weapons prohibited under Minsk agreements. “On December 4, during the visit to the settlement of Travneve (Donetsk region), the patrol of the JCCC Ukrainian side observatory group recorded damage to residential buildings resulting from the fire by the illegal armed groups ORDO using 120 mm caliber mortars, automatic grenade launchers, large-caliber machine guns. The shells hit the area of dwelling houses №12 and 15 in Tikhaya street. 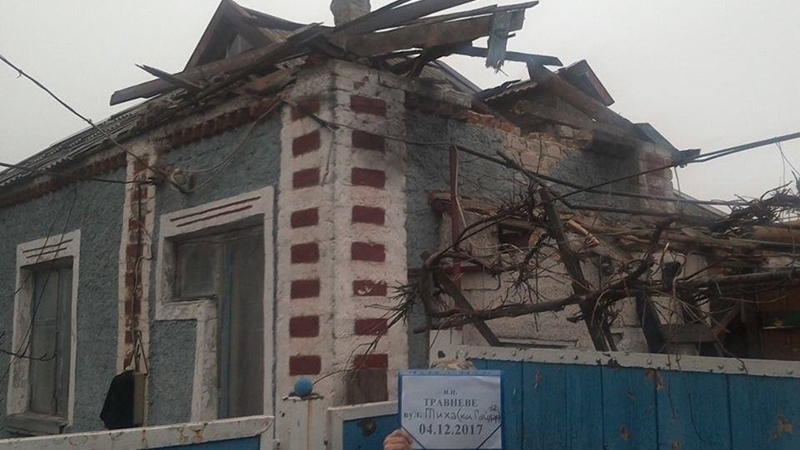 Roofs of dwelling houses and an office building were damaged,” reads the report with reference to the statement of Ukrainian side of the JCCC on the page of the ATO press center on Facebook. Ukrainian side of the JCCC reminded that the illegal armed groups deliberately damaged the power line in the district of Holmovsky which supplied the village of Travneve, and did not allow repair brigades to restore it. More than 200 inhabitants of this settlement stay without electricity supply. Moreover, the press center of the ATO headquarters reported on shelling of the village Vrubovka (in the Popasna district of the Luhansk region) on the evening of December 4. “The Russian-occupation troops insidiously fired the village of Vrubovka with the 152-mm-barrel artillery banned under the Minsk accords, exposing the dangers of civilians. ATO forces were forced to stop the impudent provocation of the enemy, and opened fire to oppress the enemy's weapons,” the statement said. Reportedly, the illegal armed groups began shelling the settlements of Travneve and Hladosovo in the Donetsk region on November 28.